The custom of two terms established by President Washington was faithfully preserved for one hundred and fifty-one years until the precedent was broken by Franklin Delano Roosevelt, winning his third term in 1940. Coolidge had been gone seven years by that time. F. D. R. would be elected for a fourth term in 1944 and die in office the following April. The twenty-second Amendment was ratified in February 1951 in order to formally establish the original two-term limit as part of the Constitution. Looking back on his five and a half years as President, Coolidge offered some enduring insights on the need for Presidential limits. This is not only exemplified by the term of office custom, which is now law, but the necessity to respect the Office, honor the limits of its power and guard against its delusory sense of greatness. This risk is not unique to the Presidency; one’s approach to authority on any level is just as prone to abuse and self-deception. …[I]rrespective of the third-term policy, the presidential office is of such a nature that it is difficult to conceive how one man can successfully serve the country for a term of more than eight years. …A President should not only not be selfish, but he ought to avoid the appearance of selfishness. The people would not have confidence in a man that appeared to be grasping for office. They live in an artificial atmosphere of adulation and exaltation which sooner or later impairs their judgment. They are in grave danger of becoming careless and arrogant. The chances of having wise and faithful public service are increased by a change in the presidential office after a moderate length of time. In the higher ranges of public service men appear to come forward to perform a certain duty. When it is performed their work is done. They usually find it impossible to readjust themselves in the thought of the people so as to pass on successfully to the solution of new public problems. An examination of the records of those Presidents who have served eight years will disclose that in almost every instance the latter part of their term has shown very little in the way of constructive accomplishment. They have often been clouded with grave disappointments. While I had a desire to be relieved of the pretensions and delusions of public life, it was not because of any attraction of pleasure or idleness. We draw our Presidents from the people. It is a wholesome thing for them to return to the people. I came from them. I wish to be one of them again…Our country does not believe in idleness. It honors hard work. I wanted to serve the country again as a private citizen. 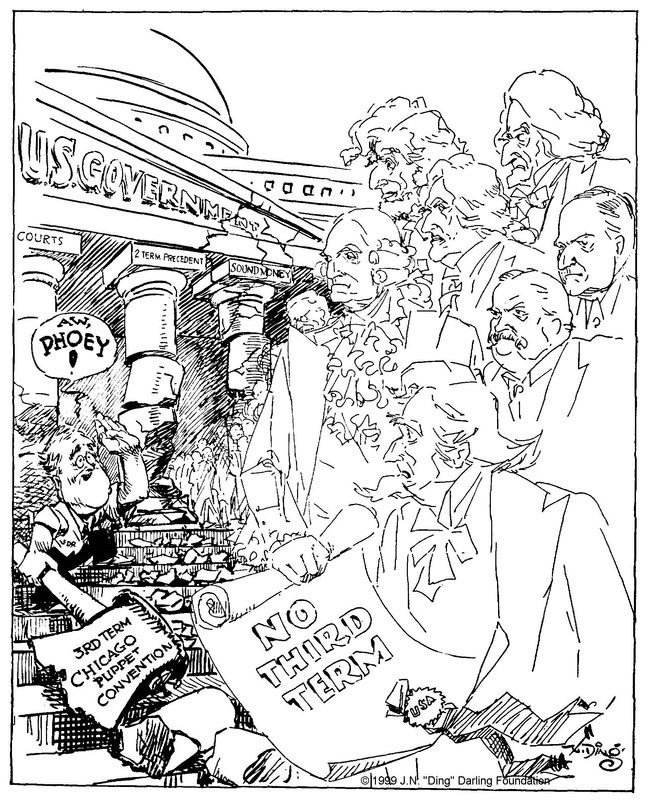 In this editorial depiction by J. N. “Ding” Darling entitled, “Just a whole lot of nobodies who never knew nothin’,” published October 15, 1940, the cartoonist conveys F. D. R.’s destructive disregard of our institutions and traditions. It is a suitable tribute that, among the “ghosts” of past Presidents arrayed against Roosevelt, Calvin Coolidge is conspicuously among them (L to R: Washington, Lincoln, Jefferson, Jackson, Cleveland and Coolidge stand in the foreground, with Theodore Roosevelt and the rest of those Presidents who have gone on, standing in the background). Coolidge’s warnings echo even now.